Vote online for Research Photo Contest! Photos taken during last summers farm visits. 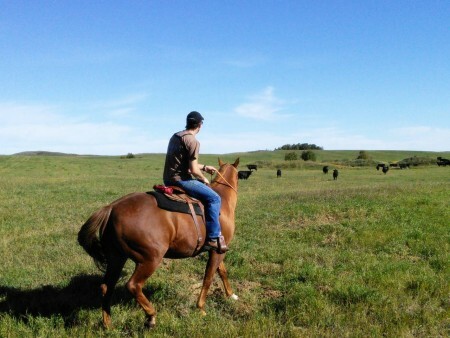 This picture shows a typical cattle ranching scene: a farmer rounding up cattle from the paddock into the corral using a horse. What is less obvious in this image is that sensors have been mounted on the saddle surface where vibration, bumps, and jolts are transmitted to the farmer. Vibration from vehicles and machinery is known to be a risk factor for low back disorder, and such vibration is commonly experienced by farmers on agricultural equipment including tractors, combines, all-terrain vehicles, and even horses. This is the first study that evaluated the whole-body vibration level on different farm equipment in Saskatchewan, and to our knowledge the first to measure vibration from horses. Vote on the U of S photo contest website!